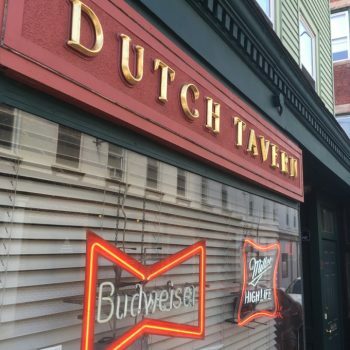 This is my first “food/restaurant” post in the “CT Restaurant Tour of the World” section in which I flew solo. I still don’t really know what to do with this section and I darn well know that I’m not qualified to write about food. Crown doesn’t need to be pretty. But I’m going to (respectfully) treat these deep ethnic experiences almost as museums. One big problem I will have is that no one hates taking pictures of food in public more than I do. I’ve never been able to do it… so we’ll see how that goes. One thing we barely have here in Connecticut is traditional “Jewish” or “Jewish Deli” food. 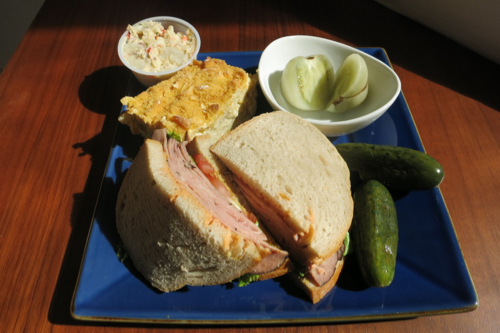 Sure, we have a bunch of “NY Delis” here and there, but my experience with the “best” – Rein’s in Vernon, left me feeling more like I was at a decent sandwich shop in Vernon, Connecticut rother than in a traditional NY Jewish deli in 1950. Crown sets up this hot dog stand out front. People seem to enjoy this. Fortunately, I live in West Hartford. My town has one of, if not the highest Jewish populations in the state. We have all levels of Jewishness here, from the kind that wear long black overcoats and black hats while walking to the temple on Saturdays to the kind who only knows what a driedel is. 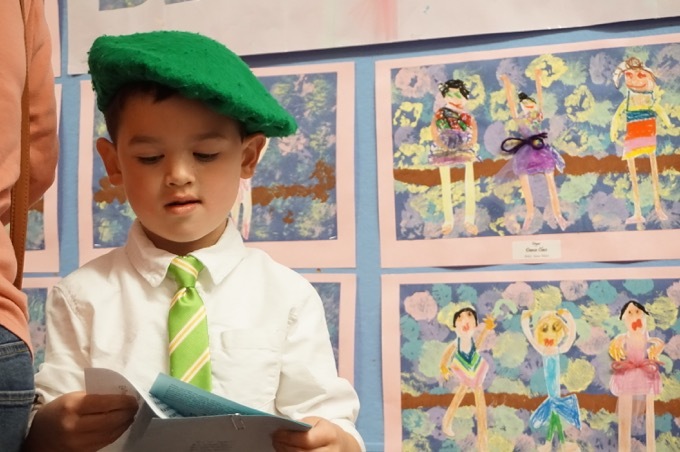 West Hartford is so Jewish, that we have a Jewish newspaper (The Jewish Ledger) and a Jewish store (The Judaica Store) that has lasted 25 years. Here’s an article about The Judaica Store in the Jewish Ledger. 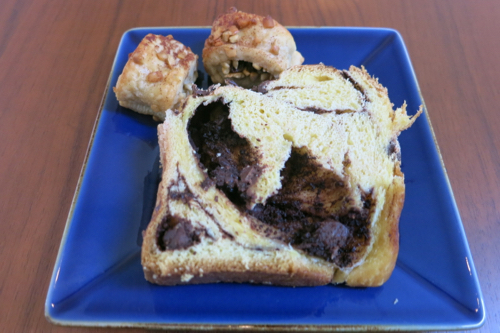 If you only get one thing from Crown, make it the chocolate bobka bread. And if you haven’t gathered by now, we have enough Jews in West Hartford to support a Jewish grocery store. Like, 100% Jewish. Super Jewish. Jewish enough to be closed on Shemini Atzeret and Simchat Torah. What the heck is a Simchat Torah? I actually tried to go on Simchat Torah. I knew well enough not to go on Rosh Hashanaha or Yom Kippur (public schools here have those days off) at least. 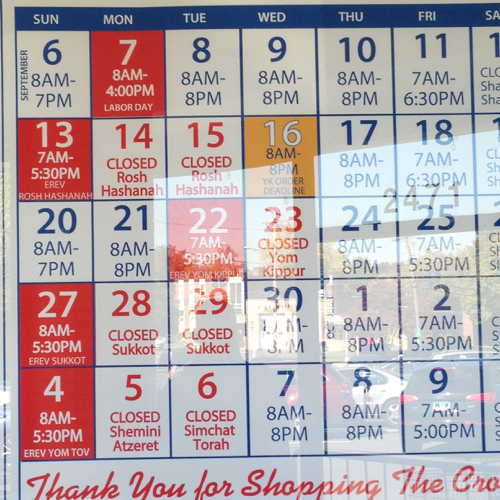 It’s hard being a non-Jewish Crown fan and keeping up with the calendar. 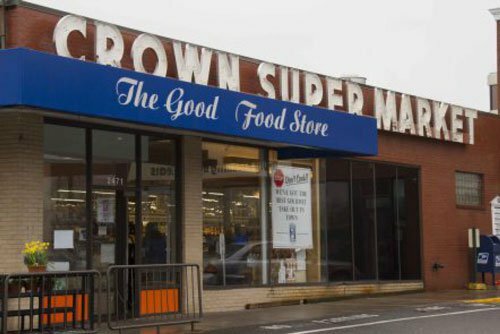 Crown Market survives in a shopping area called Bishop’s Corner which also contains a Big Y, a Whole Foods, and a Wal-Mart grocery store. It’s not an esay place to have a specialty grocery store. 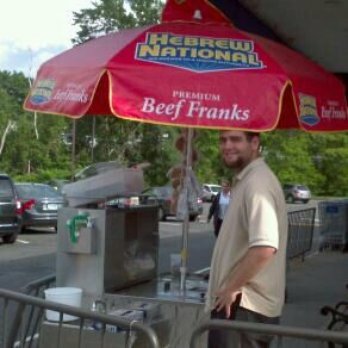 in West Hartford, Crown Supermarket marked its 70th anniversary with something new – a line of glatt kosher meats and the certification of its bakery by the Hartford Kashrut Commission; and, Big Y Supermarkets announced that it would maintain the kosher bakery and glatt kosher deli and fresh meat departments that were part of the Bishops Corner Waldbaum’s before it was sold to the Massachusetts-based chain. I’ve entered a whole new world, five minutes from my house. (Glatt kosher is, like, more kosher than plain old kosher. Something about the slaughtered animals’ lungs being “smooth.”) Okay. But too bad I don’t really eat cows or pigs. I actually thought about going for it here – with a corned beef or beef tongue or real pastrami sandwich… but nah. On day one, I went with a turkey pastrami sandwich on rye ($8.49) which comes with two lovely pickles and a side of rather forgettable (though not bad) potato salad. I’m sure some purists will be livid that this place even makes/serves turkey pastrami, but whatever. I very much appreciated it and am pretty sure that’s the first time I’ve ever even tasted what pastrami tastes like – even if it’s “fake.” I liked it well enough. Additionally, I found the idea of “sour green tomatoes” ($4.59/lb) intriguing and of course I had to grab some of Crown’s homemade noodle kugel ($6.99/lb). 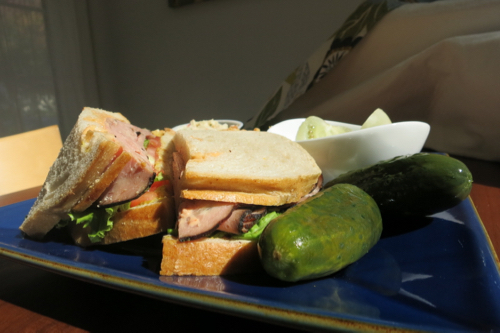 At Crown, you have a few different condiment options for your deli sandwiches. I went with mustard and horseradish, but wound up with some orange stuff. I’m guessing it’s their default Russian dressing which fortunately doesn’t have a strong flavor. The sour green tomatoes were good, but not like, “Oh my Yahweh, why aren’t these things in my non-Jewish stores? !” but rather more like, “Eh, these are pretty good, but I don’t need to go out of my way to find them” good. Which brings us to the noodle kugel. Ah, the noodle kugel. This thing melted my brain. Keep in mind, Jewish friends, I had never had a noodle kugel before in my life. I had never thought about them. I didn’t know what they are – and quite frankly, after eating one, I’m still not sure what this thing is. Well, Barry, invite me to your family’s next seder and I’ll be the judge. Actually, I’m 100% confident I’d like his two options better… the sweet macaroni kugel with a pastrami sandwich just didn’t work for me. I saved most of it to eat later, and it was still just too weird for me. My tongue and my brain couldn’t come to any sort of agreement on the noodle kugel. 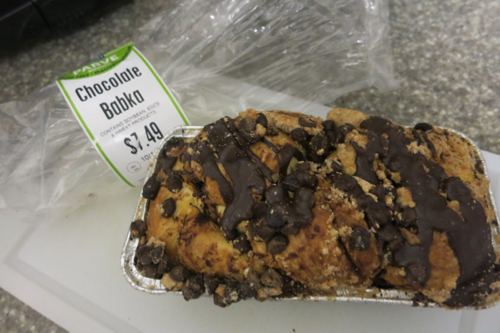 But, at least I had a chocolate bobka loaf ($7.49) which is probably one of my favorite things to eat on earth. On to day two. From the deli counter: Two potato latkes ($2.59), kasha knish ($2.49), potato knish ($2.49), and some whitefish salad ($16.99/lb). I walked around and picked up a bottle of Kedem Grape Juice ($1.39), a can of Manischewitz Matzo Ball Soup ($2.69), and from the bakery, cinnamon ruggelach ($10.99/lb). Phew. I was feeling like quite the Jew. The verdicts: the latkes were good, but even I can make them. 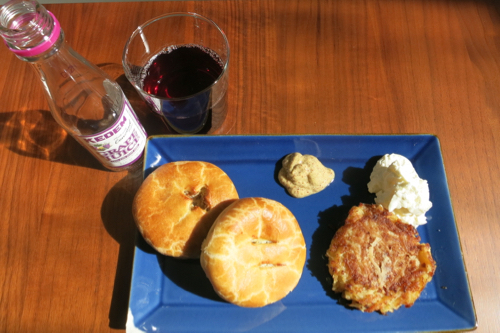 The potato knish was divine; flavorful potatoes enrobed in a light and airy pastry dough. Loved my first knish! 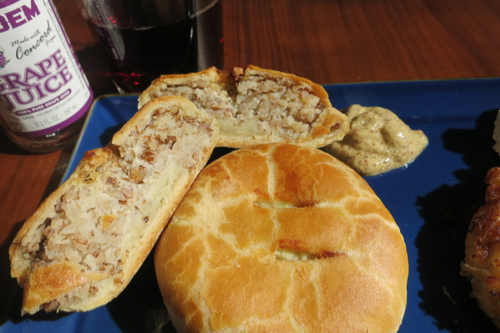 The kasha knish… was awful. It tasted, quite literally, like dirt. Kasha is buckwheat and this is probably some sort of “healthy” knish. Jewish food is not healthy at all, so my thought is that when someone tried to invent something healthy, everything just went to hell. Do not eat the kasha knish. Inside a kasha knish. No. I love fish salads of all sorts, as well as pickled fish and sardines and anchovies and pretty much anything from that world of fishy fish fish that many people abhor. Well, more for me then. 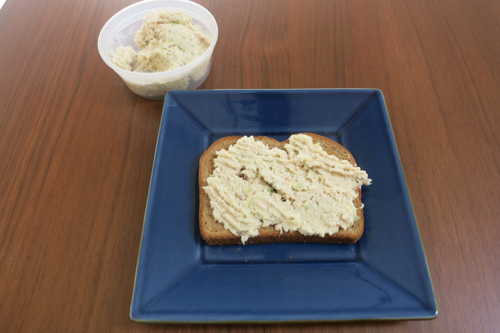 Crown’s whitefish salad is delicious. Sure it’s fishy, but it’s not overpowering. I ate this stuff for 3 days straight and am a big fan. I have no idea why Jewish people drink this Kedem stuff. It’s just super grapey grape juice. 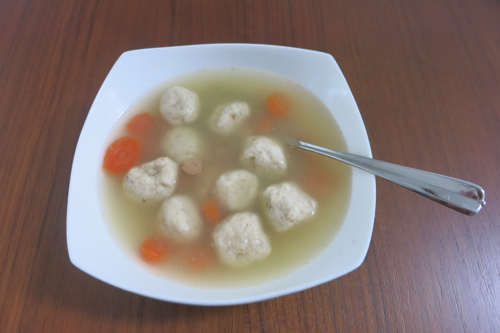 And matzo ball soup is pretty terrible too. Granted, I had it out of a can and someone will yell at me for that, but what am I gonna do? If your Jewish grandmother wants to make me some homemade soup, let’s do it. You know how to reach me. But until such time, the stuff out of a can is essentially fatty chicken noodle soup with a few lumps of gooey dough bobbing around. There is no point to this soup existing. That leaves just the desserts and as I’ve mentioned, the bobka breads at Crown are phenomenal. I love them. My wife thinks they are too dry, but nah, they are perfect. (They better be at their price.) You have get the chocolate one though. Trust me. As for the ruggelach, they were wholly forgettable – which may be due to the excellence of the bobka, I don’t know. If you have a Jewish deli that out Jewishes Crown, let me know. I rather enjoyed my two-day Crown experience, and will be revisiting them again. The guys behind the counter and the register folks were genuinely warm and kind to me. Gooey dough ball wan chicken noodle soup.